Get to know the rules of the Royal St. John’s Regatta. Below you’ll find a complete listing of regulations governing everything from crew composition to team conduct, plus helpful Regatta definitions for beginners. A coach and/or manager (at the option of the remainder of the crew) but the maximum number in a crew shall be 10. Official Representative of a Crew 2.1 The crew shall choose one of its members to be the official representative and spokesperson for the crew in all of its dealings with officials and representatives of the Regatta Committee. Official Representative and Chief Spokesperson of a Crew 2.2 Officials and representatives of the Regatta Committee may rely and act upon all statements or representations made to them by the official representative without having to determine that such statements or representations constitute the opinion or position of all or any members of the crew. Deadline for Crew Registration 3.1 The Regatta Committee shall establish an annual deadline for registration of crews and payment of fees. An Official Registration Card and waivers to be fully completed by all crews (as prescribed) prior to training on the Pond. The Registration Card shall contain the full name, physical address, phone number, email address, and birth date of each crew member, the name of the Official Representative, the name of the sponsor, the name and category under which the crew intends to row and such other information as shall be stipulated. In the case of Squirts, Juvenile, Midget, Intermediate, and Masters crews, proof of age in a form acceptable to the Rules Committee which would include birth certificate, MCP card or driver’s license for all crew members (except the coxswain, manager and coach) shall accompany the registration card. Address of Official Crew Representative 3.3 The address of the Official Representative shall be considered to be the official address of the crew and any notice from the Regatta Committee to the crew may be delivered to such address and shall be deemed to have been served on all crewmembers if left at that address. Failure to Comply 3.4 Failure to comply with the provisions of Rule 3.2 shall render a crew ineligible to participate in the Time Trial heats and Regatta Day races of that year. Change of Crew Member and Possible Appeal 3.5 No change of a crew member or coxswain shall be made after the filing of the official registration card for time trials unless the Chairperson of the Rules Committee or delegate is notified in writing and has approved the change in writing. Objection to a crew or oarsperson 3.6 The Chairperson of the Rules Committee consulting with the Captain of the Course shall cause a list of all officially registered crew members and any changes to registered crew members to be posted at the Boathouse, Quidi Vidi Lake, St. John’s after Time Trials. All oarspersons to be same gender 3.7 All oarspersons of a registered crew, as outlined under Rule 3.2 shall be of the same gender with the exception of the squirts, which is at the discretion of the Chairperson of the Rules Committee consulting with the Captain of the Course. In accordance, with the International Olympic Committee and NCAA guidelines, transgender athletes may compete in their transitioning to gender as long as they have completed 1 year of hormonal treatment with a supporting letter from their supervising physician. Gender modification surgery need not to have been completed. No race — insufficient crews 3.8 At his/her discretion the Chairperson of the Rules Committee consulting with the Captain of the Course, may determine if there are sufficient crews officially registered to justify the holding of a race. Oarsperson to row with one crew only 3.10 Any oarsperson, regular or spare, shall only be permitted to register and row with one (1) crew, with the exception of sanctioned race day activities for spares. See Rule 5.24. All crew members to wear approved dress code. Coxswain to wear approved safety floating devices. 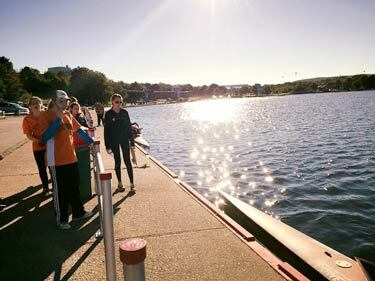 3.11 In order to prevent damage to the shells, safety to participants and respect decorum of the sport, all members of a registered crew, including coxswains, when rowing on the Pond must wear suitable clothing/attire, such as soft/pliable footwear, shorts/sweat pants, T-shirts. Coxswains shall wear appropriate Transport Canada approved safety flotation devices at all times except during official race day activities. Foot-board modifications that include affixed footwear or alternate strapping devices other than the footings/straps/restraints provided, is not permitted. Modifications may be made to the rowers footwear that permit individual comfort, such as adding padding between the feet, as long as it does not damage the shell and is completely removed from the boat after use. Similarly, any rower with a medical disability, upon provision of a medical physician’s letter to that effect, may apply for additional consideration for equipment modification. Any concerns with respect to equipment used by oarspersons should be brought to the attention of the Chairperson of the Rules Committee or the Captain of the Course to be dealt with in accordance with the Royal St. John’s Regatta Rules and Regulations. Oarlocks are currently set to a default height and are not adjustable. Modifications and adjustments shall not be made. Any modifications to the oar locks will be cause for discipline as per 3.16 and 3.17. Adhesive materials 3.13 The use of any form of tape or such adhesive materials, by participants to modify or to attach to any component of the shells or oarlocks, is not permitted. 3.14 All coxswains shall sit in their designated seating area at all times while steering a race Shell during an official Time Trial and/or Regatta Day racing event, otherwise that crew shall be disqualified from that racing event. 3.17 Non-compliance with 3.12, 3.13, 3.14 and 3.15 during any officially sanctioned regatta event shall result in immediate disqualification. Race Course 4.1 The race course for the various divisions or classifications of races to be held on the day of the Time Trials and Regatta Day shall be that set out on the plan annexed to these rules. Safe rowing condition on the pond 4.2 The Regatta Committee shall equip the race course with starting stakes, appropriate ropes and toggles, turning buoys, judges’ platforms, judging Boats, and safety Shells, as the Captain of the Course, in conjunction with the Rules Committee, may in their sole discretion determine as being adequate for the safe conduct of any and all sanctioned events. (c) A Red Flag shall indicate that NO CREW OR OARSPERSON shall be permitted to row on the pond during that period of time. Time Trial heat schedule 5.2 The Chairperson of the Rules Committee and/or the Captain of the Course shall establish a Time Trials heat schedule based upon the number of crews officially registered. Not more than five (5) crews may participate in any one Time Trial race. Rules for Time Trials same as Regatta Day events 5.3 The manner of conducting any Time Trial heat shall be the same as that established for Regatta Day races and the time in which a crew completes the course in a Time Trial race shall be as recorded by the Chief Time Keeper. (c) where, in the sole opinion of the Captain of the Course, an affected crew or crews would be unfairly prejudiced by an accident or equipment breakage or malfunction, or any other adverse advent at the discretion of the judges, the affected crew or crews shall be granted the opportunity to row again for time only. (d) the affected crew or crews, as nearly as is practical, shall maintain the same Shell and stake as it rowed during the Time Trial heat in which the accident or equipment breakage or malfunction occurred and shall row again in an available heat and Shell as determined by the Captain of the Course in his /her sole discretion. Schedule of results for Time Trial heats 5.5 The Chairperson of the Rules Committee shall, in consultation with the Captain of the Course, after the completion of the Time Trial heats, compile a race day schedule for the annual Regatta Day races. If more crews are registered than the Regatta Day race schedule can accommodate, the Chairperson of the Rules Committee in consultation with the Captain of the Course may eliminate crews from Regatta Day competition starting with the crew in each division having the slowest time at the Time Trial heats until the number of entries remaining can be accommodated in the Regatta Day race schedule. The Chairperson of the Rules Committee has the sole discretion to maintain a reasonable ratio of races in each division as justified by the number of crews registered. Elimination of crews to accommodate a Regatta Day race schedule 5.6 After the Regatta Day race schedule has been established by the Chairperson of the Rules Committee and/or the Captain of the Course, a meeting will be held at which the Official Representative of each crew participating in the Regatta Day race schedule shall be obliged to be present. For the safety of all participating crews, there will be no choice in stake positions. All stakes will be assigned depending on the results of the Time Trial heats with the exception of the Squirts division. The crew rowing the fastest time in Time Trial heat Division shall be assigned to stake 1; the crew rowing the second fastest time in Time Trial heat Division shall be assigned to stake 2; the crew rowing the third fastest time in Time Trial heat Division shall be assigned to stake 3; until all crews in each Time Trial heat of a division has been assigned to a stake. At this meeting a selection will be held in a manner determined in the sole discretion of the Chairperson of the Rules Committee and/or Captain of the Course wherein the crew rowing the fastest time in its Time Trial heat Division shall be permitted to select the Shell of its choice; that the crew rowing the second fastest time in the same Time Trial heat Division shall be permitted to select the Shell of its choice after the first crew has made its choice; that the crew rowing the third fastest time in the same Time Trial heat Division shall be permitted to select the Shell of its choice after the first and second crews have made their choices, etc., until all crews in each Time Trial heat of a division has selected a Shell of its choice, in accordance with the procedures as directed by the Chairperson of the Rules Committee. The choice of Shell by an Official Representative is final and shall be binding upon the crew that that person represents. In the absence of an Official Representative representing a crew, the Chairperson of the Rules Committee, or his/her nominee, may in his/her sole discretion accept as the Official Representative of a crew a person nominated in writing by the registered Official Representative of that crew, or nominated in writing by a majority of the oarspersons of that crew. In the absence of an Official Representative, the Chairperson of the Rules Committee, or his/her nominee, shall assign a person to select a Shell for the crew whose Official Representative is absent and such choice of Shell shall be binding upon such crew. The meeting of Official Representatives for the purpose of conducting the selection for Shells shall be held at the Boathouse, Quidi Vidi Lake, St. John’s, upon the completion of the Regatta day schedule, the time and date to be determined by the Captain of the Course. Postponement of Time Trial heats and resulting race times 5.7 In the event that the Time Trial heats are postponed while in progress, and are continued over the next day or several days, the resulting times recorded by crews in all races rowed prior to the postponement shall be official. The postponed portion of the Time Trials shall be completed on a date and at a time designated by the Captain of the Course. No coaching of race shell crews from certain locations 5.8 There shall be no coaching of race shell crews during the Time Trial heats and/or any Regatta Day Racing Events including Championship Races from any designated official Regatta judging location including, but not necessarily limited to: Judges’ platform (top of pond); Judges’ Boat (bottom of pond); Marquee; Shell House Control Centre Room(s)-(veranda location); Visitors’ Boat; and/or any other locations as may be otherwise designated “off limits to coaching” by Chairperson of the Rules Committee in consultation with the Captain of the Course. Delay, postponement of Regatta Day racing events 5.9 After the commencement of the racing event, the Captain of the Course shall have the discretion at any time on any basis he/she considers reasonable in the interests of safety, sportsmanship, fair play, or in the interests of the enjoyment of the Regatta by the participants and spectators, to delay, postpone, or reschedule the annual Royal St. John’s Regatta, or any incomplete portion thereof. Prior to the Captain of the Course exercising his/her discretion to make such delays, postponements, or rescheduling to the annual St. John’s Regatta Day Program, or incomplete portion thereof, the Captain of the Course may in his/her sole discretion as he/she deems necessary, consult with other Regatta Day officials. Number of Crews permitted in one racing event 5.10 No more than five (5) crews shall start in any one racing event. Coxswain to be approved by Rules Committee 5.11 All coxswains must be determined as being competent and shall be approved by the Chairperson of the Rules Committee. New coxswains must have completed the course offered by the Boathouse and Pond committee. Exceptions may be considered by the Chair of the Rules Committee in consultation with the Captain of the course. Except during designated race day activities, all coxswains must wear flotation devices approved by Transport Canada while in the shells. Failure to comply will be treated as in 3.16. Ten (10) Minute Rule 5.12 All crews must be at their respective starting stakes to start their assigned races within ten (l0) minutes of the race being called over the loud-speaker at the Boathouse. This requirement shall be known as the “Ten Minute Rule.” The call of a race and the commencement of the Ten Minute Rule shall not be made until the last Shell in an existing race has passed the Marquee on its way to the finish line at the top of the pond. Any crew not in position to commence a race within ten minutes after the race has been called may be disqualified by the Captain of the Course from participating in that race. Crews to enter chosen boats as soon as possible 5.13 All crews shall immediately enter their designated Shell for the next scheduled race as soon as their assigned Shell is available at the Boathouse dock and, in any event, no later than immediately after the announcement of the commencement of the 10-Minute Rule, as noted under Rule 5.12 above and shall proceed immediately and directly to its assigned starting stake at the top of the pond. Crews at starting stakes 5.14 When all Shells and crews have reached the starting stakes, the coxswain for each crew shall grasp the toggle attached to the assigned starting stake for that crew in his/her hand and the crews shall cause all Shells to be lined up evenly directed by the Chief Judge/Starter. “Are you ready Number 3? The coxswain of each crew shall signify to the Chief Judge/Starter the readiness of that crew to start the race. When all coxswains have indicated their readiness, the Chief Judge/Starter shall ask again “Are you all ready?” and, in the absence of an indication from any coxswain that a crew is not ready, the race shall be started by the firing of a gun, or the sounding of a horn, as a signal for the start of the race. Accident/equipment failure prior to one minute into race start 5.16 In the event of an accident or equipment breakage or malfunction following the start of a race and prior to the Shells in that race reaching the one minute mark from the start, and only where the said accident or equipment breakage or malfunction would, in the sole opinion of the Chief Judge/Starter, endanger the safety of any crew member or unfairly prejudice a crew, a second gun shall be fired, or horn sounded, to stop the race and recall the Shells to the starting stakes for a re-start of that race. In the event of the occurrence of such an accident, equipment breakage or malfunction, the coxswain of the affected crew shall indicate the happening thereof by raising his/her hand over his/her shoulder. Official race after the one-minute mark 5.17 When a racing event reaches the one-minute mark from the start of that race and there are no accidents/equipment failures, etc. prior to that time into a race, the race shall then be designated as an Official Race and the race shall continue until the completion of that racing event at the top of the pond. (b) All Shells shall approach and round their respective turning buoys on the south side of that turning buoy and shall finish the race on the north side of their respective starting stake. Any crew violating this rule shall be disqualified from the race. Coxswain shall not touch stroke oar 5.19 Any coxswain putting his/her hand upon the stroke oar during a race shall result in the crew being disqualified from that race. Official race results 5.20 The result of any race shall not be official until all assigned officials have reported to the Chief Judge/Starter at the top of the pond, and it is ascertained and confirmed by the Chief Judge/Starter that none of the rules and regulations with respect to the conduct of the race has been violated by any crew competing in the specific race being reported on. Objection to conduct of a race 5.21 Any crew objecting to the conduct of its race shall immediately make its protest known to the Captain of the Course or Chairperson of the Rules Committee immediately upon disembarking from the racing shell at the Boathouse wharf, failing which, the official results of that race when announced at the discretion of the Captain of the Course shall be final. The decision of the Captain of the Course in his/her sole discretion as to any protest concerning the conduct of a race shall be final. Official race times 5.22 The official time for all races shall be as recorded by the Chief Time Keeper, who shall report directly to the Chief Judge/Starter following any one racing event. Times and order of finish are by use of the electronic timing system with mechanical stopwatch backup by the time keepers and judges at the top of the pond. Use of spare oarsperson first 5.23 A crew must utilize its registered spare oarsperson(s) before applying for permission to use a substitute oarsperson. 5.24 Prior to the start of a sanctioned race event, all registered spares will be entered into a Spare Pool. Additional spares may be entered into this pool at the discretion of the Chair of the Rules committee with consultation of the Captain of the course. Waivers must be signed and if applicable, proof of age provided. Any team requiring a spare beyond that of their own registered spare(s), if they have one, may apply to the Chair of the Rules Committee to use a spare of their choice from the Spare Pool as long as that spare is willing to row and that age and gender restrictions, if applicable, apply. Any spare may only row with one team during a sanctioned race day event. In the event that any race, or races, on the Regatta Day Race Program are postponed and continued on any other day, and for the purpose only of compiling and running off the Men’s/Women’s Championship racing events and, as a minimum, should the first six (6) racing events of the Regatta Day Race Program be completed prior to the postponement of the remainder of the Regatta Day Racing Program, then the five (5) fastest racing times rowed in each of the racing divisions prior to the postponement, shall qualify those crews only for participation in their respective Championship racing event. The Shell positions and times for all races rowed prior to the postponement shall be final and official. The postponed portion of the Regatta Day Program shall then be completed on a date and at a time as designated by the Captain of the Course. What crews are permitted in Championship Race? 6.1 There shall be a Men’s and Women’s Championship Race, where races shall consist of the five (5) fastest times on Regatta Day and may include crews from the Master, Senior, Intermediate and Juvenile age categories. List of crews with fastest times in each Division 6.2 Immediately after the completion of the regular race day schedule (excluding Championship Races), the Chairperson of the Rules Committee and/or Captain of the course shall compile a schedule showing the times rowed by each of the Men’s crews and Women’s crews during the Annual Regatta Day schedule commencing with the fastest time for each division. More than five (5) fastest times 6.3 In the event of a tie for the final position in a Championship Race, then the crew with the fastest time in the Time Trial heats shall be awarded a position in the Championship race. Crews qualified to row in Championship Race but refuse to row 6.4 Forty-five (45) minutes after the completion of the regularly scheduled races, crews qualifying to row in the Championship Races shall notify the Captain of the Course of their willingness to row. If the Captain of the Course becomes aware of a crew/crews who have qualified to row in either the Men’s or Women’s Championship Races but who for any reason will not be rowing in that race, then the Captain of the Course may, in his/her sole discretion, permit the next crew or crews with the next fastest time or times rowed in that division on Regatta Day to row in that Championship Race in the place of the crew /crews who will not be rowing. Crew refusing to race in its scheduled race, Championship Race 6.5 Crews qualifying for each of the two Championship Race Divisions, shall choose Shells and stakes in order of their times rowed during those divisions of the Regatta Day Race Schedule starting with the crew rowing the fastest time in its division. When selection for boat and stakes take place 6.6 The selection for Shells and stakes shall be held at the Boathouse at a time determined by the Chair of the Rules Committee and the Captain of the Course after the posting of the regular Regatta Day race results as stipulated in Rule 6.2. In the absence of an Official Representative representing the crew, the Chairperson of the Rules Committee, or his/her nominee, may in his/her sole discretion accept as the Official Representative of a crew a person nominated in writing by the registered Official Representative of that crew, or nominated in writing by a majority of the oarspersons of that crew. In the absence of an Official Representative, the Chairperson of the Rules Committee, or his /her nominee, shall assign a person to choose the Shell for the crew whose Official Representative is absent and such choice of Shell is binding upon such crew. Captain of the Course and Chief Official 7.1 Captain of the Course is the Vice president of the Regatta Committee. The Captain of the Course shall be the Chief Official and Public Spokesperson for the Regatta Committee during all sanctioned events. The Captain of the Course shall also be the Chief Official responsible for the conduct of sanctioned events, and shall be vested with all of the authority of the Regatta Committee with respect to the conduct of the sanctioned events, except where by these Rules the said powers are assigned to any other Official Representative or sub-committee of the Regatta Committee. The Captain of the Course shall be an active member of the Rules Committee. List of Race Officials 7.2 The Captain of the Course shall cause to be prepared and/or approved for each annual Time Trial and Regatta Day, a list of the various Officials required for the conduct of the sanctioned events. Conflict of Interest 7.3 No person shall serve as an official for any Regatta activity where his/her so acting shall place him/her in a position of actual or perceived conflict of interest. The Captain of the Course shall be the sole judge of such conflict of interest. Code of Conduct applicable to all Regatta activities 8.1 This Code of Conduct applies in general to all oarspersons, coxswains, managers, coaches, sponsors, and officials at any time during any Regatta Committee sponsored activity (“Regatta Activity”) including, but not limited to, practice spins, Time Trial heats, Regatta Day races, banquets, award presentations, or related activities. Duty of all Regatta participants 8.2 All oarspersons, coxswains, managers, coaches, sponsors, and officials have a duty to encourage and maintain the highest standard of good sportsmanship, gentlemanly conduct, fair play and safety and are under an obligation to avoid all unsportsmanlike conduct and any acts or practices which are, in the opinion of the Regatta Committee, detrimental to the conduct of any Regatta activity including practice spins. xii) other actions detrimental to the safety of persons or detrimental to property of the Regatta Committee or to the impairment of the operations of the Regatta, its events, equipment or otherwise. ii) being under the adverse influence of alcohol or drugs within the precincts of any facilities owned, managed or controlled by The Royal St. John’s Regatta Committee. 8.4 Disciplinary Proceedings: The Captain of the Course in consultation with such officials as he /she considers appropriate in the circumstances, shall be vested with the full power and authority to disqualify and suspend (without any right of appeal) from any Regatta activity described in Rule 8.l any oarsperson, coxswain, or crew whom the Captain of the Course considers in his/her sole discretion to be in breach of the Code of Conduct set out in Section 8 of these rules. Boathouse Rules 8.5 Shell house Rules: The Boathouse Manager in his/her sole discretion may implement rules with respect to the day to day activities on the Pond and around the Boathouse and the Boathouse Manager may in his/her sole discretion implement penalties with respect to failure to comply with these rules. Notice of Hearing 8.7 Notice of Hearing – After receipt of the complaint and unless the complaint is settled to the satisfaction of the Board of Directors, the complainant and the accused, the President shall establish the time and place for a hearing of the complaint and shall give notice to the complainant and the accused of such time and place. Holding of Hearing 8.8 Hearing – The hearing shall be held at a location determined by the Board of Directors. Each complainant and accused may appear at the hearing in person. At the hearing the Board of Directors shall receive such evidence, reports, submissions and arguments as it deems necessary to properly judge the complaint. All decisions of the Board of Directors shall be by simple majority. The decision of the Board of Directors shall be final (without any right of appeal). 8.9 Failing to Attend – If the complainant fails to attend the hearing without sufficient cause satisfactory to the Board of Directors, the Committee may adjourn the hearing, may dismiss the complaint or administer a penalty. 8.10 In the event of a collision between shells during a sanctioned race, that the Captain of the Course, in consultation with the Chair of the Rules Committee and any judges that might be involved, shall determine if fault for that collision rests with the action of a coxswain. If fault is found, that coxswain will be banned immediately from the rest of that supervised event. In addition, they would be banned from coxing until after the next sanctioned event. For example if it occurred during Regatta day, they would not be permitted to cox again until after Discovery day of the following year. In the event of a second offense a more severe penalty will be administered which will be determined by the Captain of the course in consultation with the Chair of Rules. “Accident” means any collision, upset, loss overboard of a crew member or similar event causing or likely to cause injury to a crew member or damage to equipment. “Captain of the Course” as defined in Section 7.1. “Chief Judge” means the Regatta official approved on an annual basis by the Regatta Committee to be the chief adjudicator of racing event in the sanctioned events who shall report directly to the Captain of the Course should adjudication be required and/or requested. “Chief Time Keeper” means the Regatta official approved on an annual basis by the Regatta Committee to be the chief statistician and compiler of all the times recorded by crews in sanctioned events. “Coach” means any member of a crew who serves as an instructor for any crew. “Code of Conduct” means the code of conduct established under Section 8 of these Rules. “Coxswain” means the member of a crew who is “steers person” of the racing shell. “Intermediate” means any oarsperson who shall be under the full age of twenty one (2l) years of age as of December 3l of any particular year in which the Regatta is held. “Intermediate Crew” means a crew in which all of the oarspersons are of intermediate age. “Juvenile” means any oarsperson who shall be under the full age of eighteen (l8) years of age as of December 3l of any particular year in which the Regatta is held. “Juvenile Crew” means a crew in which all of the oarspersons are of juvenile age. “Manager” means any person being a member of a crew who controls or manages the activities of the crew. “Men’s Master’s Crew ” means a crew whose minimum oarspersons age shall be the full age of forty-six (46) years as of December 31 of any year in which the Regatta is held. “Midget” means any oarsperson who shall be under the full age of fifteen (15) years of age as of December 3lst of any particular year in which the Regatta is held. “Midget Crew” means a crew in which all of the oarspersons are of midget age. “Minimum Age for any Coxswain” (male or female) shall be nineteen (19) years of age as of December 31 of any year in which the rowing event is held. “Minimum Age for any Oarsperson”* (male or female) is 10 years of age as of December 31 of any year in which the rowing event is held. “Oarsperson” means any member of a crew whose primary purpose for membership in the crew is to act as a rower. “Officers” means the Immediate Past President, President, Vice-President(s), Secretary and or Treasurer of the Regatta Committee. “Officials” mean those Regatta Committee members selected by the Captain of the Course required for conducting the sanctioned events. “Participant” means any oarsperson, coxswain, and manager, and coach, sponsor of a crew or any person taking part in any Regatta Committee activity. “Rules Committee” means a formal sub-committee approved by the Board of Directors of The Royal St. John’s Regatta Committee whose purpose shall be to compile, revise, recommend, and enforce all officially approved rules and regulations of The Royal St. John’s Regatta Committee for the conduct of sanctioned events, and other Regatta events/activities that may take place on the pond from time to time. “Sanctioned events” refers to Discovery Day, Time Trial heats, and Regatta Day. “Senior” means a division/classification wherein all the registered oarspersons of a rowing crew are not rowing as a Midget, Juvenile, Intermediate or Master crew, as defined under Section 9(q); 9(l); 9(j). “Shell” means any practice shell or race day shell owned by the Regatta Committee or, in the context, any other Shell owned by or operated under the auspices of the Regatta Committee. “Spare Oarsperson” means a registered oarsperson who (at the option of the coxswain and the regular oarsperson) may substitute for any regular registered oarsperson in any Regatta activity, as prescribed by these Rules and as outlined under Rule 1.1 (c) and 5.24. “Sponsor” means any person, organization or corporation lending support to a crew. “Substitute Coxswain” means a registered coxswain permitted to participate in a sanctioned event pursuant to Rule 5.11. “Substitute Oarsperson” means a registered oarsperson permitted to participate in a sanctioned event pursuant to Rule 5.24. Squirt: For Any oarsperson between the age of 10 and 13 as of December 31 of the year of the regatta. Squirts row a modified course and must wear approved flotation devices at all times. Rowing during sanctioned events may be impacted by weather and is at the discretion of the Captain of the Course. Take the age of the rower on Dec. 31st of the year of the regatta. If that person is 10, 11 or 12 they may only row squirts. If they are 13 they may row Squirts or Midget but only one age catagory in any regatta. For a rower age 14 on Dec. 31st they must row Midget or potentially Juvenile. “Ten Minute Rule” means the rule in place from time to time pursuant to Rule 5.12 hereof relating to the commencement of sanctioned events. “The Royal St. John’s Regatta Committee” or “Regatta Committee” means The Royal St. John’s Regatta Committee registered in Corporation No. l549 in the Registry of Corporations for the Province of Newfoundland and Labrador. “Women’s Master’s Crew ” means a crew whose minimum oarsperson age shall be the full age of forty-one (41) years as of December 31 of any year in which the Regatta is held. Repeal 10.1 All other rules and regulations of The Royal St. John’s Regatta Committee relating to the matters contained herein are hereby repealed.